There's not a whole lot to say about this cancelled stamp from August 1944, other than the glimpse into the past that it provides. 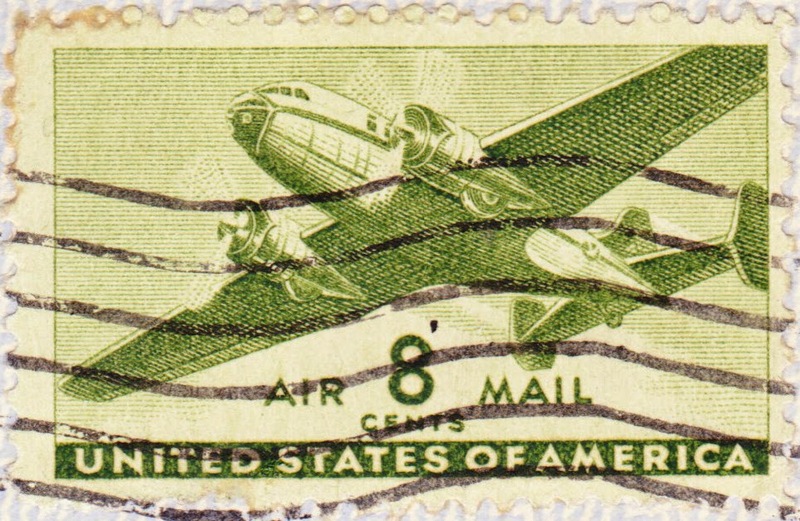 It's the Scott C26, an 8¢ U.S. air-mail stamp featuring a twin-motored transport plane. It was first issued on March 21, 1944, with a press run of more than 1.7 billion stamps. The same image was used on numerous air-mail stamps of various values between 1941 and 1944. You can see a gallery of them on this 1847usa.com page. I also came across an interesting newspaper article from 2012 about a Pennsylvania woman who found a 1944 love letter affixed with the 8¢ air-mail stamp tucked away inside an old book. My stamp, however, has been stripped of most of its context. It was cut from its envelope and kept with a small pile of other old stamps and ephemera.